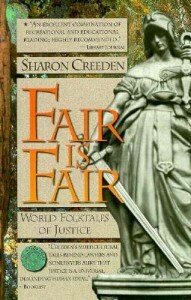 I'll bet Sharon Creeden is a wonderful storyteller to hear in person. She did a good job of rewriting these various tales in a tellable form, although they interestingly have a variety of styles because of their varied origins. Plus they're a nice range of takes on the theme of justice (certainly one of THE most central themes in world folk stories!) I have almost no quibbles about her selections except I wish she hadn't gone with the sickly-sappy Hans Christian Andersen story "The Rose Elf" when there are so many better versions of "Isabella and the Pot of Basil". I have more mixed feelings about her attempts to introduce some information about legal issues, as commentary which is often only barely connected to the story it follows. Her simplified school-age discussions are just OK. I actually like John B. Mitchell's introduction better, though it's broad and general.